I spent a lot of time with this customer quilt. This double wedding ring was pieced by Diana Alexander and her daughter, Aubrey Sills, as a wedding gift for a relative. Several people saw this in progress on the frame, and fell in love with it. 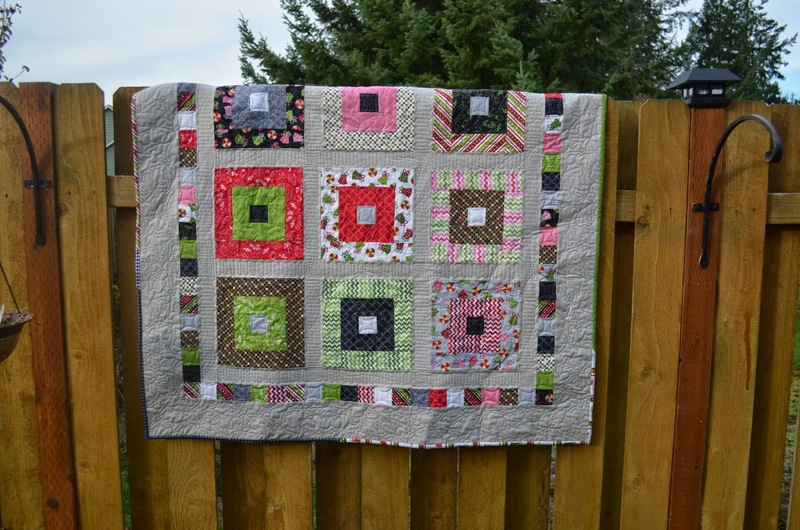 This was made using the Quick Curve Ruler by Sew Kind of Wonderful. I had a lot of inspiration from looking at photos on their blog. 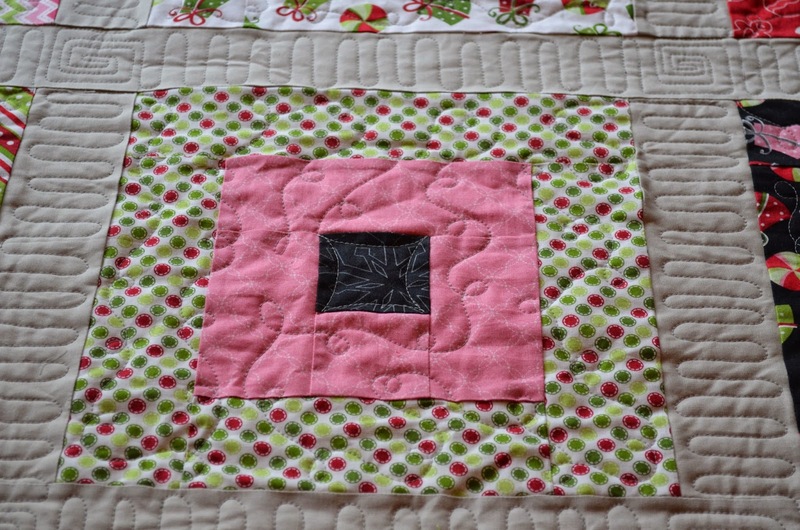 I knew it would take me a while to quilt, because I was trying several techniques that were new to me. I learned a LOT from this quilt. 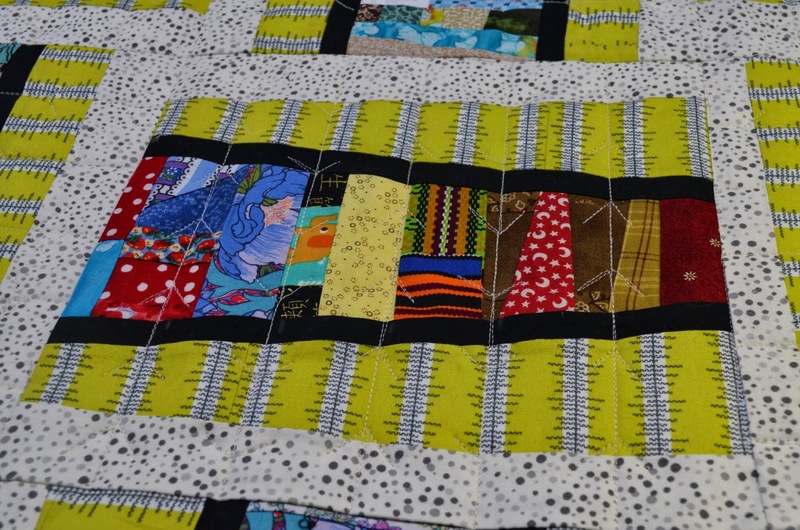 There is something wonderful about seeing a quilt stretched out on the frame and seeing how it develops. 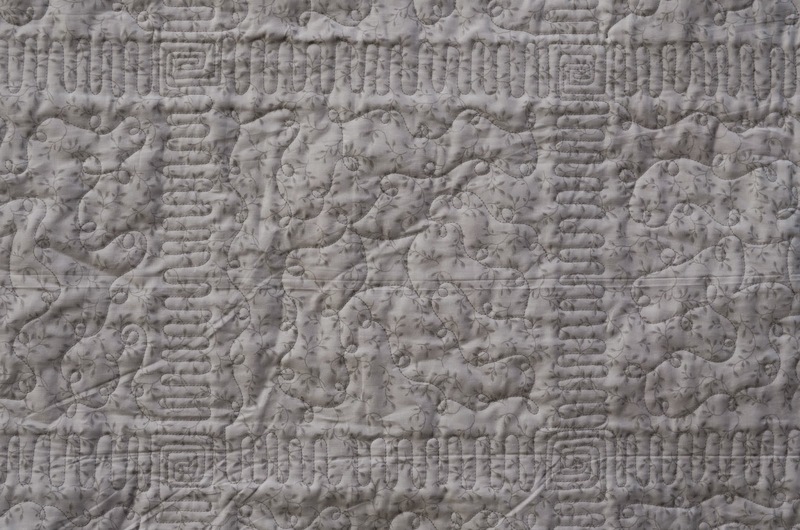 I wanted to both recreate the style of quilting I had seen from other photos, and simplify it so that it wouldn’t be too overwhelming for me to quilt (remember, I’m still pretty new to this). 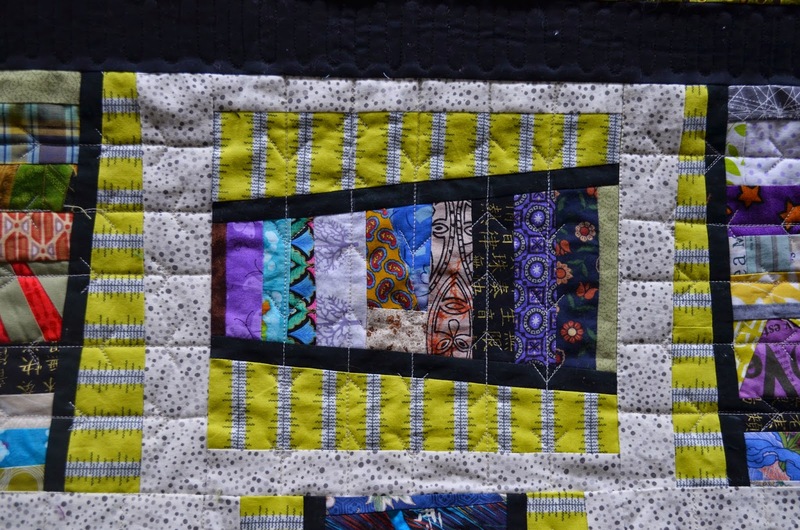 One of the great things about this quilt from a learning perspective, is that the repeated design elements gave me plenty of opportunity to see my skills improve and with it the amount of time it took for me to complete a section. 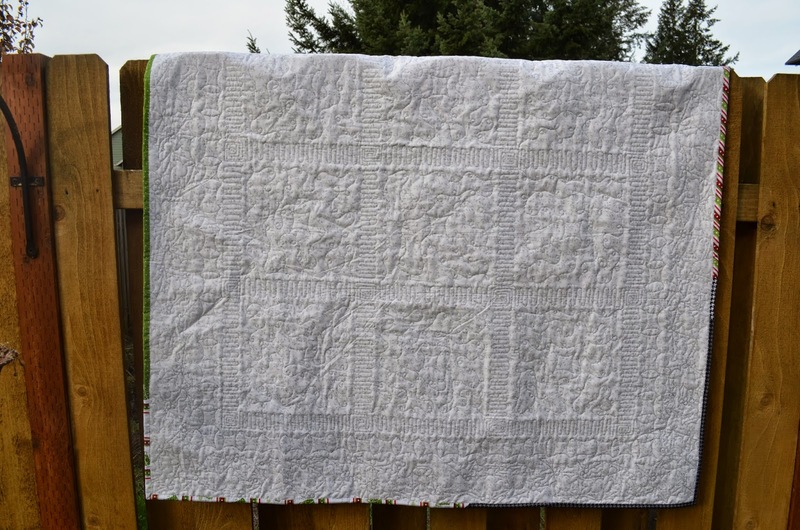 I’m proud to report that I cut my quilting time in half when comparing my time at the beginning of the project and towards the end – good thing, or I might still be quilting it! I’m sure this will be a treasured gift for the bride and groom! 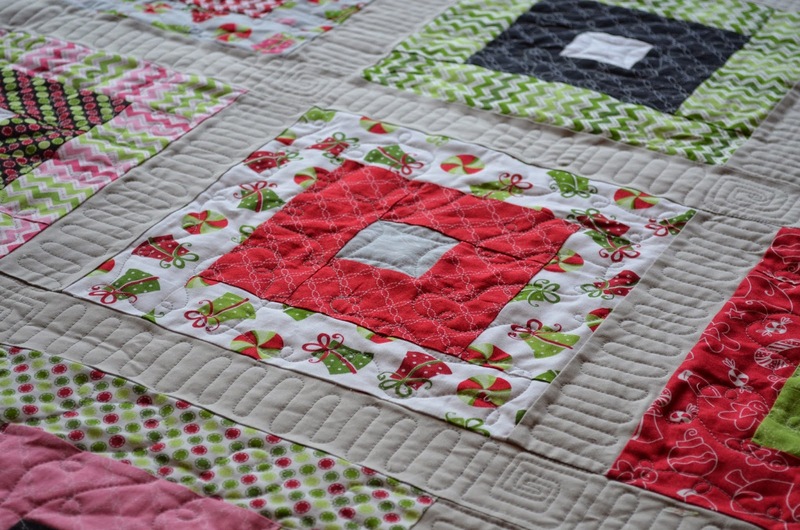 I’ve been busy quilting away and super excited to share this one with you. This is a customer quilt that I recently finished that will be a Christmas gift, so I promised not to disclose the name of the customer to keep the secret. 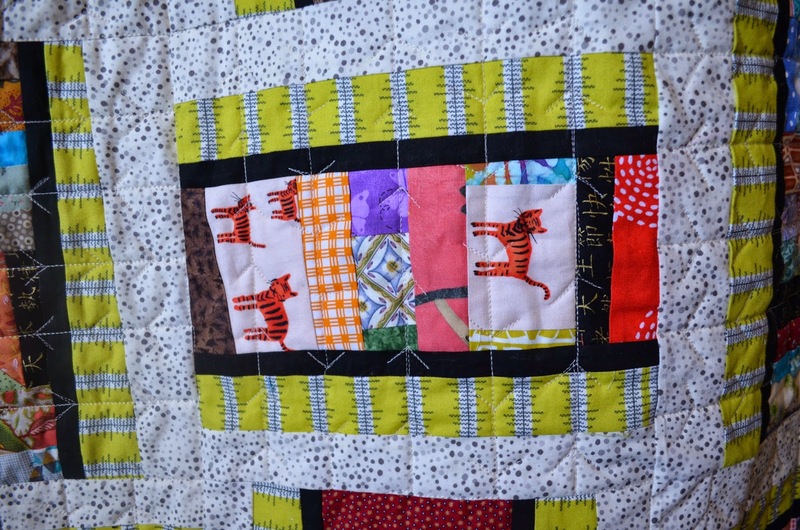 I absolutely loved studying all of the scraps lovingly pieced together and showcased in this beauty. 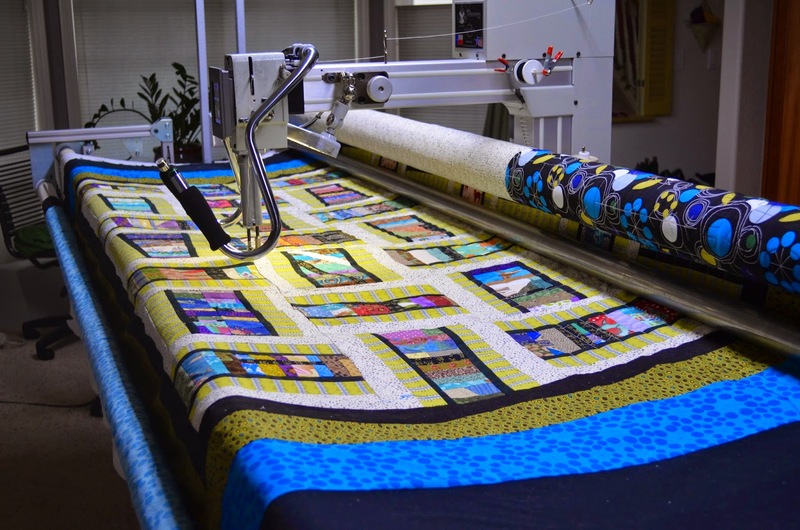 This is the largest quilt to be loaded on my longarm, and I used almost every inch of the 12 feet to pull it off. I learned quite a lot from this project. 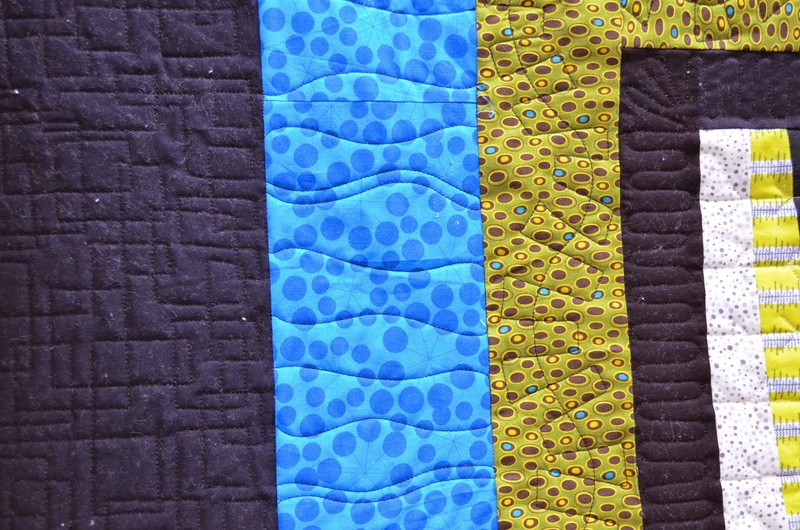 Since it was a modern design, I got to try out some geometric quilting in the outside border, some waves in the blue, and a curvy zig zag in the green. 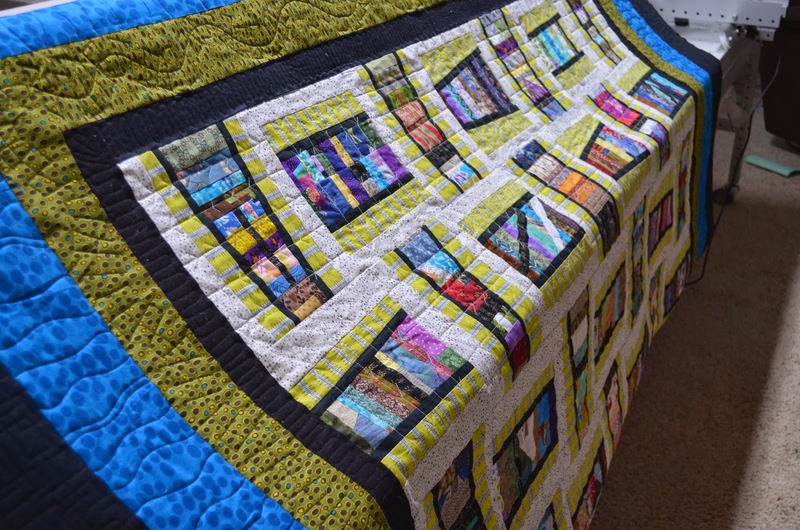 The funky curves were so much fun to quilt! Isn’t the electric blue just stunning? I think so! I went with an arrow motif for the body of the quilt. I didn’t get photos of the back, which was pieced as well. The arrows really stand out on the back as well. Each block is cool, but I thought I’d share a few of my favorites. I just loved this fish. I’m super envious of the fabric collection that contributed to this beauty. The tigers were another favorite of mine. It was so big, I couldn’t get a picture of the whole thing, but I just had to share what I could. 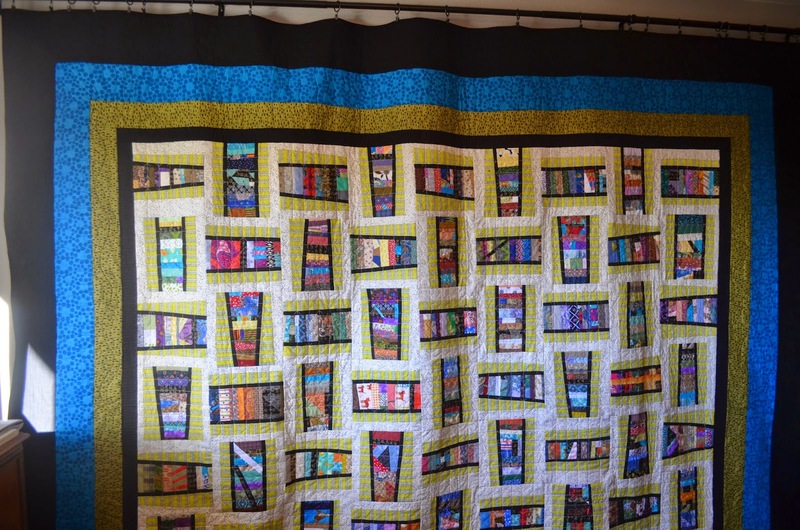 It is based on a pattern by Helene Knott of Oregon City. I’m thinking when I build my fabric collection large enough to pull this off, this is a quilt I just might make for myself someday! 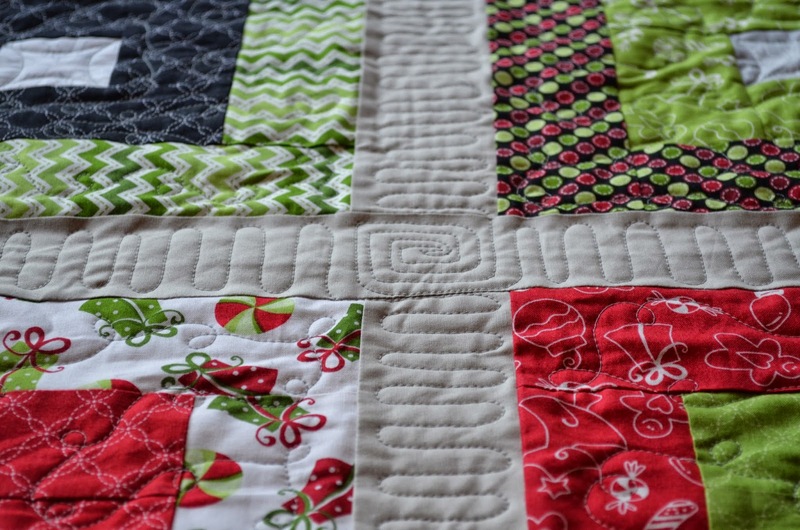 I have been so busy that I haven’t done any holiday themed quilting and wanted to try out a free-motion holly motif that I had been thinking about. 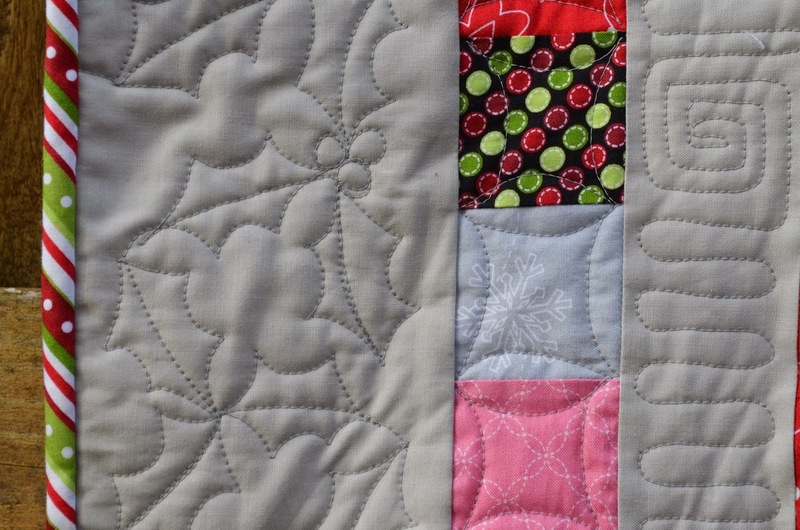 When I picked up this Christmas Jelly Roll, I didn’t notice that it had pink in it – but I think it gives it a more modern look. 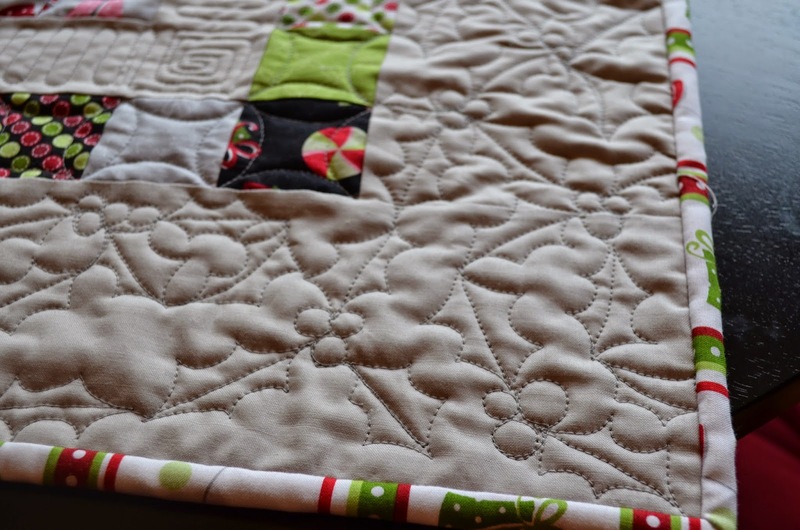 This is the first time that I’ve used a loopy filler pattern – I didn’t want to compete with the Christmas fabric patterns, and I had fussy cut the snowflakes in the middle of the squares so I didn’t want to distract from those either. I also didn’t want to have too much competition from the quilting in the sashing, so I went with a simple wavy motif with Greek keys in all the intersecting corners. 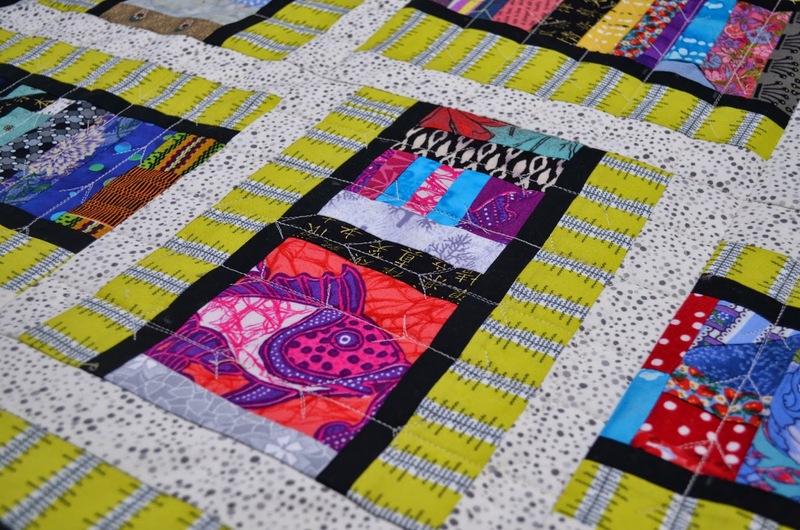 One thing I’m always excited to see is how the wholecloth quilt back looks – it’s always a surprise. 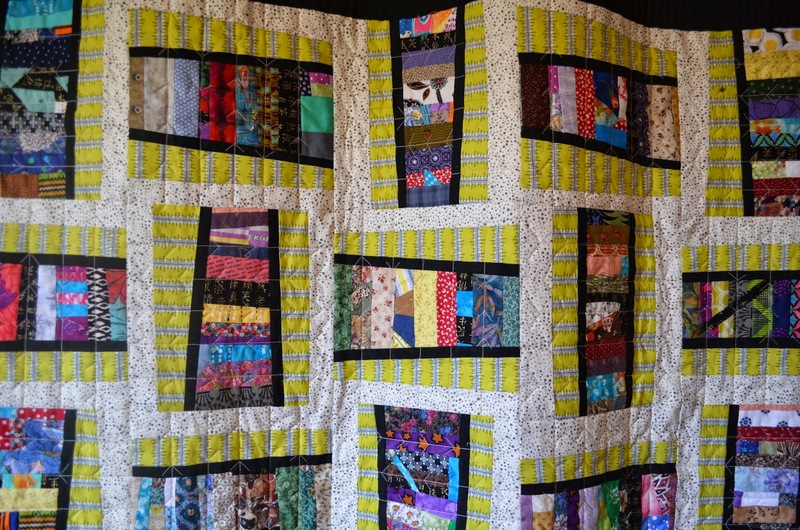 And finally, a look at the whole quilt.